Canada’s progress on climate change has been marked by key policy announcements, but only modest progress on real emissions reductions thus far. In December 2016, Canada’s First Ministers met to discuss, among other issues, the proposed Pan-Canadian Framework on Clean Growth and Climate Change. Introduced by the Trudeau government several weeks prior, a cornerstone of the action plan was a price on carbon: starting at $10/tonne in 2018 and rising to $50/tonne by 2022. A price on carbon is not the only pillar of the plan, despite the flurry of protest and punditry that it has triggered. It also promises to wean the country off of coal-based electricity, revise building codes and accelerate the uptake of electric vehicles. The Pan-Canadian Framework was followed by the Mid-Century Long-Term Low-Greenhouse Gas Development Strategy, which began a national conversation about what a long-term transition to a low-emissions society might look like, with transformative targets of an 80 per cent reduction in emissions by 2050. In a communiqué issued by First Ministers on the day the Pan-Canadian Framework was adopted, it was noted that clean technology and a focus on innovation are central to the success of the plan, including the creation of new and better jobs in a more resilient economy. It is clear that ambitious steps must be taken, in addition to pricing carbon, to reduce emissions through all other remaining avenues. Building retrofits, enhancing public transit infrastructure and shifting homes away from natural gas (see here) will be central to these efforts. If a parallel goal, however, is to create new and better jobs in a resilient, carbon-neutral economy, then it will become increasingly important to understand and engage with the small business sector. Small and medium-sized enterprises (SMEs) in Canada employ 90.3 per cent of workers in the private sector, play a proportionally large role in job creation relative to their larger corporate counterparts and produce approximately 30 per cent of Canada’s gross domestic product. Yet despite promising stories of social innovation and sustainability leadership, recent research suggests that the majority of SMEs have little interest in facilitating accelerated transitions toward environmental sustainability. The business case for the implementation of sustainability-oriented changes in business operations, for instance, remains a significant challenge. The caricature of the reactive, conservative SME misses a key opportunity for engagement: Is it possible that when some SMEs tackle sustainability, they can do it with greater agility, ambition and creativity than is possible in a larger firm shackled by complex organizational hierarchy and shareholder demands? Rather than dwelling on the evidence that SMEs give short shrift to sustainability, municipal, provincial and federal policymakers would benefit from a better understanding of the tools at their disposal that could both build a business case for sustainability among SMEs while strengthening the resilience and prosperity of communities. To overcome the reactive nature of SMEs and the skepticism with which they may view voluntary action to improve environmental performance, established, tested solutions can be shared both within and among sectors. SMEs tend to rely on relevant examples of best practice showcasing traditional and proven solutions. Management systems and toolkits which are familiar to SMEs and which are perceived as easy to implement have shown higher degrees of participation. Some experiments have taken place, but the potential for such projects to scale up to a greater number of businesses and broader geographical swathes remains largely untapped. We have a relatively strong understanding of the resource, capacity and motivational barriers faced by some small businesses, but little is known about the internal characteristics of SMEs that might yield the dramatic reductions in greenhouse gas emissions and other sustainability metrics through technical and social innovations we’re aiming for. A recent survey that we at the University of Waterloo’s Sustainability Policy Research on Urban Transformations Lab administered to nearly 1,700 Canadian SMEs gives us some inkling of the important ways that decision-makers should reframe their efforts to engage SMEs and accelerate sustainability innovations. 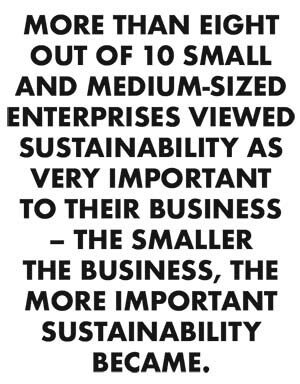 More than eight out of 10 SMEs viewed sustainability as very important to their business – the smaller the business, the more important sustainability became. Also striking was the importance of cost reductions over subtler, socially motivated reasons for making progress on sustainability. While the general story is that businesses are first and foremost rational profit maximizers, we found that SMEs viewed an enhanced reputation in their community as a stronger motivator than cost reductions. SMEs may also be making more significant progress on sustainability, especially on its many and varied social dimensions, than their larger corporate counterparts. For example, nine out of 10 businesses reported that they actively foster employee well-being, seven out of 10 said they are engaged in creating an inclusive work environment and participate in community outreach, and five out of 10 businesses said they actively support social justice. Sustainability presents a constellation of challenges: It often requires holistic, long-term thinking in order to consider the ripple effects of decisions. For example, how can incentives for active transportation reduce health care costs, increase employee productivity and even minimize the burden on urban infrastructure by getting cars off the road? How can a compelling vision of the role that a company plays in sustainability improve employee retention and build the company’s brand to entice new customers? Small businesses, while often facing significant capital constraints and human resource challenges, hold enormous potential to produce radical technical and social innovations that may lead us along the pathway to a fundamentally sustainable future. Government, civil society groups and informed citizens will play a crucial role in unlocking this potential. Sarah Burch is a Canada Research Chair in Sustainability Governance and Innovation out of the University of Waterloo.